Oversized Adirondack Rocker, solid log wood, contoured seat, wide armrests, weather resistant, rustproof hardware, natural finish, can be painted or stained, new. Castlecreek Log Coffee Table, made from pine logs, naturally weathered, premium-grade lacquer, 41x22x20, inspected, new. 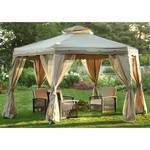 12' Paradise Gazebo, accordion design system, 1 person setup, fine mesh netting, tie backs at the corners, mesh covered central roof cupola, storage bag, file photo, inspected complete, like new. Pair of Wooden Wagon Wheels, 36'', hand burnished finish, 12 wooden spokes, new. 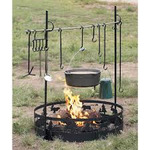 Guide Gear Campfire Cooking Equipment Set, 4'10" side posts, 4'4" steel crossbar, 5 hooks, lid lifter, utensil holder, canvas carry bag, new. 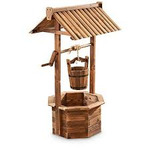 Wood Wishing Well Planter, solid wood, burnt finish, squared wishing well pavilion, hanging metal banded wooden bucket, inspected, new. 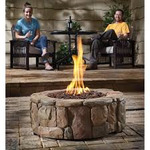 Castlecreek 28" Gas Fire Pit, adjust the output up to 30,000 BTUs, push button pulse igniter, uses 20lb propane tank, stainless burner, lava rocks, 10' regulator hose, tank holder, hang tag and cover, inspected, new. 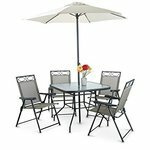 Deluxe Outdoor Patio Dining Set, 4 folding chairs, table and umbrella, tempered glass top table, 36 x 36, 6'6" diameter umbrella, breathable textilene chairs, inspected, new. 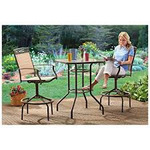 Outdoor Patio Table & Chairs Furniture Set, powder coated steel construction, 30" x 30" x 39" glass top table, umbrella hole in center of table, high back swiveling chairs, inspected, new. 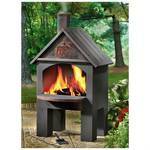 Castlecreek Cabin Cooking Steel Chiminea, high temperature paint finish, interior grate, Northwoods style, weather resistant, 20" x 25" x 43", inspected, new.